WW collets differ from milling collets (P/N 3060) in that they have a hole all the way through the collet and drawbar. 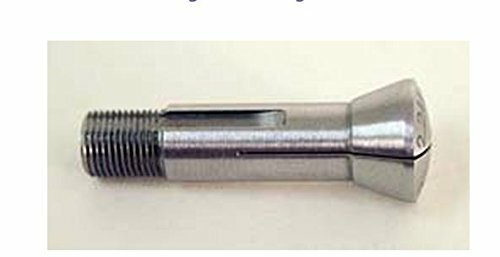 The maximum diameter stock that can pass entirely through the collet is 3/16" or 4.5mm, although collets are available up to 5/16 and 8.0 mm. The WW collets that are larger than the through-hole diameter are sometimes referred to as "pot" chucks. Sherline collets are numbered logically. Inch collets all begin with part number 1160 followed by two digits which indicate the size in 64ths of an inch. For example, P/N 116004 is 4/64" (1/32"). Sherline WW collets are available in inch sizes by 64ths of an inch from 1/64" to 5/16". If you have any questions about this product by Sherline, contact us by completing and submitting the form below. If you are looking for a specif part number, please include it with your message.